At the time, Vic didn’t have any idea how to make boots and says he had never even owned a pair. “I was just crazy. I greatly overestimated my ability and greatly underestimated the difficulty that these guys (pointing to his staff) go through making boots. They have a tremendous amount of skill and I learned right here by makin’ boots that didn’t fit,” he laughs. Not only did he have a lot to learn on the boot-making front, but as soon as Victor took over he set about integrating women into the all-male shop. “I almost had a revolution!” he says, and when his male staff found out he was paying the women the same wage as men things went even further south. In an effort to derail the integration and drive the women out the male employees hung naked pictures of women throughout the shop. But Victor had hired a woman named Martha, a “firebrand” as he tells it, who went out and found a magazine with similar pictures of naked men and stuck a centerfold prominently on the wall near her workspace. According to Victor, within minutes at least four men complained – “do you believe they can publish pictures like that? !” they demanded. The pictures of the naked women quickly came down but Vic’s troubles were far from over. The male employees began to say intentionally vulgar things while they worked to embarrass the women and make them uncomfortable. That is, until Victor hired one of his employee’s wives. “It was like a chess game” he says, chuckling. There was still tension for a time until finally he taught a woman named Luna to work the most difficult machine in the shop, the welt machine. It took an enormous amount of skill to run that particular machine and as the only person that could now do it, the rest of the staff had to rely on Luna’s work in order to complete their jobs. After this, things started to calm down and some peace settled in at the shop. 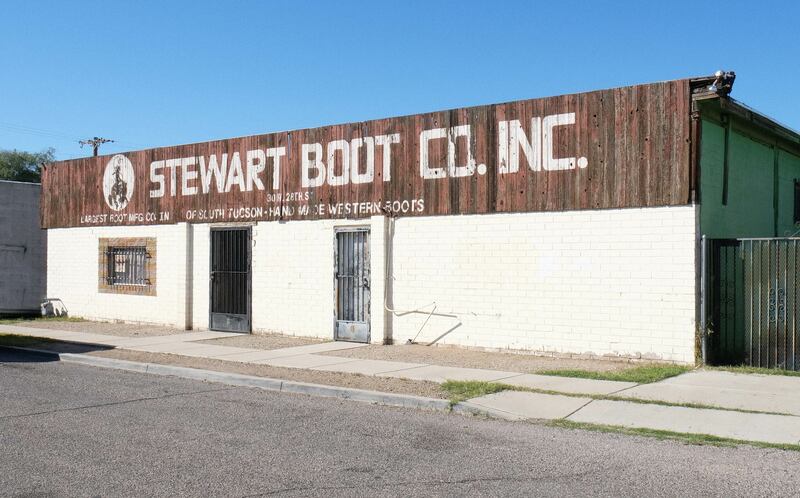 Victor grew Stewart Boots into a thriving business with 44 boot makers working on over 1000 pairs of boots a month, supplying 150 western specialty stores in 35 states. Now a tiny staff that includes Victor, his wife Linda, and 4 master boot makers – mostly aging, Spanish-speaking craftsmen (one an employee from 1971 and another a nephew of someone from that original crew) – Stewart boots is one of the last places still making fully handmade cowboy boots in the USA. “Everything but the nails is made right here in this building in Tucson” boasts Victor. No corners are cut in this shop – one pair can take up to 7 months to make, using leather that is made and tanned in the USA, dyed all the way through so the boots never lose their color, and is pre-shrunk piece by piece so getting caught in the rain doesn’t affect the size and fit of the boots. The simple and classic 0124 Boot is a style that was designed by Ronnie Stewart in 1946 and not a stitch on the best-selling style has been changed since. A destination for those lucky enough to get there for a pair of custom boots (pack some snacks and water if you go, it’s a full day’s odyssey to be fitted), with other machines still humming day and night replacing worn-out soles and freshening up boots sold over the last 40 years. “Making the whole boot by hand is what separates us from everybody else. Our boot is designed from the ground up to be repairable because we loathe the throw-away society that we live in now. If something goes wrong with a certain part of the boot, you don’t have to throw the whole thing away, just repair that part. Boots we made 20 years ago are just as good as boots we’re making today. Now you can’t say that about many products, can you?"